‘Satyameva Jayate,’ (Truth Alone Triumphs) is part of the first stanza of Shloka 3.1.6 of Mundakopanishad. 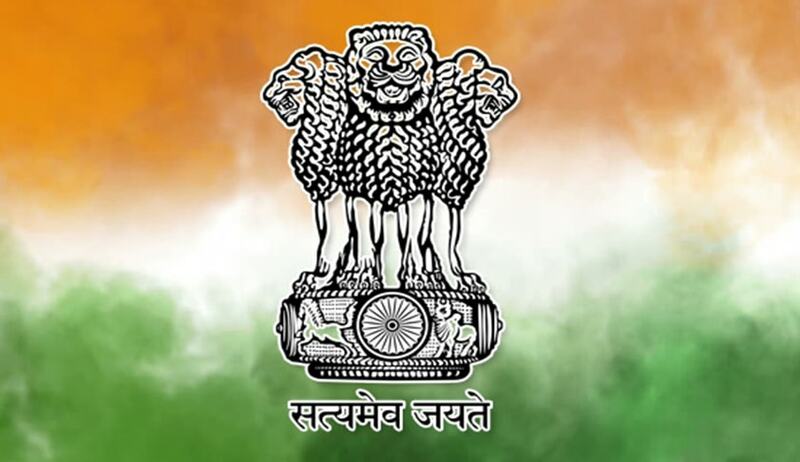 Satyameva Jayate was adopted as the motto of the Nation, on India becoming a Republic on 26.1.1950. Mahamana Pandit Madan Mohan Malaviya, during his second term as the president of the Indian National Congress in 1918, chose the slogan ‘Satyameva Jayate’. The choice of the slogan ‘Satyameva Jayate’ might have been to counter the propaganda of the ruling British, who made efforts to propagate the myth that the Indians are untruthful. Perhaps, the idea was also to expound the importance of Truth in the context of Indian ethos and culture. The word ‘motto’ is defined as “A short sentence or phrase chosen as encapsulating the beliefs or ideals of an individual, family, or institution”. Most of the countries invoke God, faith, unity, strength etc., in mottos. By choosing ‘Truth Alone Triumphs’ as the motto of the newborn nation, the makers of the Constitution signified the importance given to ‘Truth’ as an ideal for the nation and it stands distinct from the common and usual mottos of most of the countries. The courts in India, except for the Supreme Court, follow the motto ‘Satyameva Jayate’. The Supreme Court follows the motto ‘Yato Dharma Stato Jayah’. The first line of the Shloka 3.1.6 of Mundakopanishad declared “Satyameva Jayate-Nanritam” that is, Truth Alone Triumphs - Not Falsehood. The ‘Nanritam’ in the Shloka is extremely significant. While Satya alone must triumph and be victorious, ‘Anritam’ (untruth or falsehood) must be conquered and defeated, without exception and under all the circumstances. Unless checked, the ‘Anritam’ would cause immense damage and may triumph over ‘Satya’. The courts and tribunals, having the pious duty of rendering justice, are immediately and equally concerned with Satya and Anritam i.e., Truth and falsehood. The above referred four judgments show the importance of Truth, the falling moral values, the damage that is being caused to the justice delivery system due to false and frivolous litigation and the necessity to deny the benefits to the wrongdoer. What was really troubling the court in these four cases, nay in most of the cases, is Anritam - The false pleas. The judgments rendered by the Supreme Court and the high courts repeatedly stressing the importance of Truth and declarations that ‘Anritam’ will not be tolerated, hardly percolates to the common man. Consequently, false and frivolous litigation is proliferating and has become the bane of our justice delivery system. Litigants raise utterly false pleas before the courts, as it is profitable to fight and drag on the litigation as long as possible. The delay in such cases is inevitable, as the courts have to discern the truth. The overburdened judiciary takes decades to adjudicate and grant relief to the aggrieved party. The party raising false pleas before the courts knows that at the end of the day, a few decades later, even if he loses the case, it is still hugely profitable. There is hardly any deterrence preventing a litigant from raising false pleas. The deterrence is simply not enough or proportionate to the benefits derived by raising false pleas. The laws and the courts are unable to deal with this menace of false and frivolous litigation and the stress laid by the courts repeatedly warning of the consequences of ‘Anritam’ has no effect, with the result the cancer of false and frivolous litigation, is taking its toll on the health of our justice delivery system. The ‘Anritam’ part of the Upanishad is vital. ‘Satyameva Jayate’ as the motto of the nation is apt, but the courts need a bit more. The courts have to deal with ‘Anritam’ and stamp it out. It is necessary to enlighten the general public and warn them that ‘Anritam’ will not be tolerated. The message must not only be delivered but instilled in the common man. The repeated declarations and warnings by the courts in judgments are not having the desired effect. A motto, however, is capable of spurring people to achieve a goal and get over mental doldrums. I am not suggesting that changing the motto will change everything or stamp out ‘Anritam’ on its own. But it cannot be ignored that a motto has its own intrinsic value and influences the thought process. While ‘Satyameva Jayate’ as a motto is apt for the nation, for the courts ‘Satyameva Jayate - Nanritam’ may be more appropriate. The message, that ‘Anritam’ will not be tolerated, can be effectively communicated and instilled by ‘Satyameva Jayate - Nanritam’ as the motto of the courts, (other than the Supreme Court), to strike at ‘Anritam’ with proportionate force and determination, so that ‘Truth alone Triumphs - Not falsehood’. C Mohan Rao is an Advocate-on-Record, Supreme Court of India. reach to where is that supreme treasure of Truth. See the second lecture titled “On the Truthful Character of the Hindus’ by Freidrich Max Muller, Cambridge University 1882, Published under the title, “India: What Can it Teach us”. The lectures were “specially intended for the candidates for the Indian Civil Service.” Mr. Muller during the course of the lecture said: “So often has that charge of untruthfulness been repeated, and so generally is it now accepted, that it seems almost Quixotic to try to fight against it." For example: US-In God We Trust; France- Liberty, Equality and Fraternity, Poland- God, Honour and Home Land; Pakistan- Faith, Unity and Discipline. From Anusashana Parva, Bheeshma Swargarohana Upaparva of Mahabharata, where Bhisma tells Yudhisthira that “Yato Krishna Tato Dharma, Yato Dharma Stato Jaya” i.e. Where there is Krishna, there is Dharma and where there is Dharma, there is victory.